American Cart’s Big Autumn Sale! American Cart is offering the best prices of the year! American Cart is combining its Fall Sale, Black Friday, and Cyber Monday into one fabulous savings event! Starting now and running for three weeks, the sale will feature all of our best selling items. We rarely run promotions, but when we do, we make them count. Now is the time to load up before the end of the year on quality American Cart products. The sale ends November 30th. If there is an item not include in the promotion, please CONTACT US. We would love to help you lock in these exclusive savings. 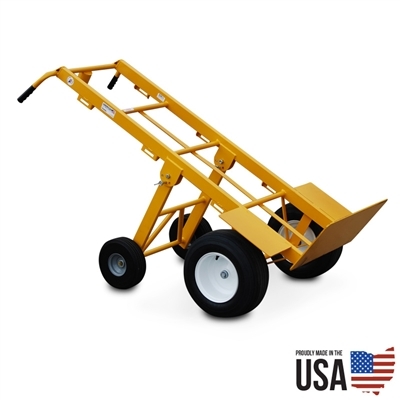 American Cart and Equipment has had a great year of sales. Combining top quality steel with expert craftsmanship, American Carts are built to last. Each cart is still made in Archbold, OH with care and precision. 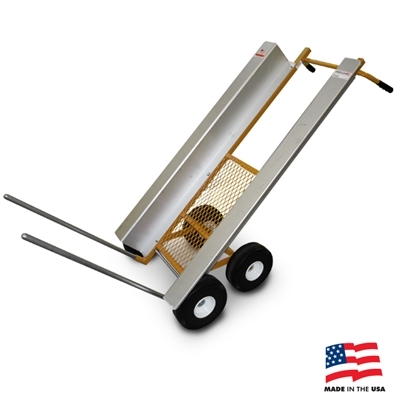 American Cart has developed it’s hand trucks over the years to fit customer requests. Almost every feature on the carts has come from a customer who needed a heavy duty hand truck for a specific application. 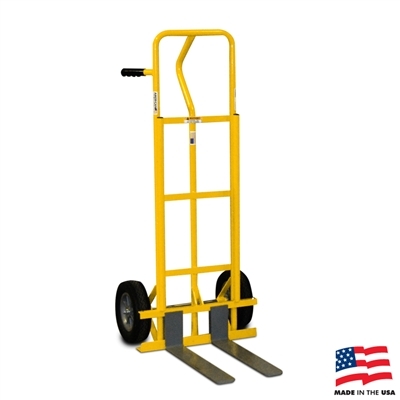 The Fork Hand truck has been a top seller since it’s introduction. The 3 inch adjustable steel forks allow for increased versatility over a normal hand truck. The forks can fit under mini pallets much easier and quicker than a pallet jack. 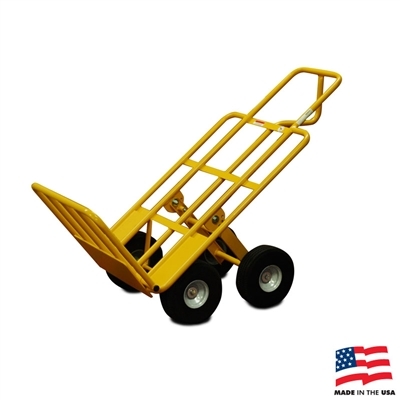 The cart is built to typical American Cart heavy duty specs allowing for a robust 500 pound capacity. The fork hand truck is commonly used in the following industries: office supply, feed mill, and packaging. Flat free wheels ensure the cart is ready to go at all times and has a smooth operation. Recent updates to the cart include a NEW industry leading 3/4″ axle and new rear brackets for improved durability. The Table Storage Cart has steadily increased in popularity. It was created out of a demand for increased warehouse storage and improved organization. The inside width of 31″ and length of 60″ provide ample room for storage. 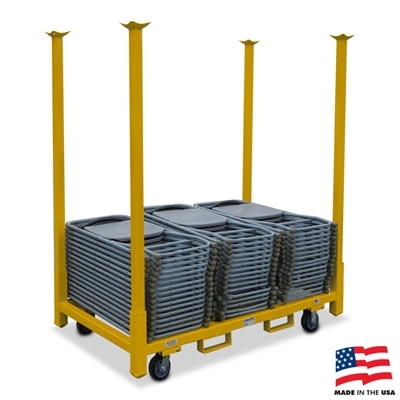 Easily stack and store 1,500 pounds of tables or chairs. The legs are removable for transportation or for additional applications. The table storage carts can be stacked up to three high. This allows for minimizing warehouse space footprint while maximizing versatility.The cart is maneuvered via four heavy duty swivel casters The cart is backed by a three year warranty. The Multi Mover and Multi Mover XT are perfect for hauling oversized loads. The Multi Mover was designed for the tent and inflatable industry. It has since grown to take on other uses and applications. The rear wheels provide improved balance and stability when hauling heavy loads. The foldable foot plate is 4 times larger than a standard hand truck. The Multi Mover has a capacity of 750 pounds and the Multi Mover XT has a capacity of 1,000 pounds. These two units have been top sellers since their introduction and continue to get rave reviews from customers who want a well made hand truck with increased capabilities. The Mantis-X looks completely different than most hand trucks, and that’s a good thing. It is able to provide unique benefits that other carts cannot compete with. It is great for inflatables and awkward items. The Mantis really shines when it comes to hauling chairs. It can also haul up to 50 chairs with the optional chair pallet. The chairs fall right into place on the Mantis-X and are secured in place via the metal flaring. The chair pallets can be used in warehouses to store inventory and allow for maneuvering without a fork lift. The capacity of 750 pounds ensures that it can handle everything that comes it’s way. The Mega Hauler is a heavy duty cart capable of handling 1,000 lbs. The 13 inch flotation tires provides traction across different terrains. The rear wheels help to distribute the load and makes moving larger loads manageable. The cart’s size provides opportunity for applications that that would not be considered movable by a normal hand truck. There is a trailer hitch attachment that allows the car to be used with our trailer dolly. The rear wheels can be laid flat and the cart sets on the trailer dolly allowing it to be used as wagon. This can be very helpful when moving objects with extended lengths or widths.